It all started back in the summer of 2012 when I started helping my cousin design her wedding invitations. I went full blast on them, constantly thinking, coming up with interesting and creative ideas to make them shine. You see, I'm actually a web designer and have been working at an ad agency for 13 years designing websites. Helping my cousin work on her printed invitations surprisingly kickstarted this whole idea of me selling posters. By mid fall of 2012 I started experimenting evenings and nights with some illustrations and designs, coming up with ideas and wondering if people would actually like my work enough to buy them. When I finally launched my first series of prints and actually sold some of them, all of a sudden I got this vision in my head "Wait, I can actually do this for a living! I think I just found my dream job." For some people, it might not sound so appealing, but for me and a lot of artists I assume, going down into your basement studio, putting your head down, and working alone straight throughout the night sounds like a dream. Being able to work on my own ideas all day long, doing what I love and selling my work to people that actually want to buy it. It's way more rewarding than any other kind of job I've ever worked on. Most of my posters are based on quotes. I try to look for great quotes that have great meaning with which I can play off of visually. Quotes have always spoken to me. They speak to a lot of people in general which is I guess why people connect with what I do. I've always loved great quotes. They make you think, you can relate to them, you can learn from them. When I design my posters, I want people to look at them without getting it at first glance, and then look at it a bit more carefully, and figure it out! That's the pay off! People looking at it feeling like they've accomplished something, they did it, they solved it! It's not just a pretty visual, they're interacting with it. That's always a wonderful moment to witness! 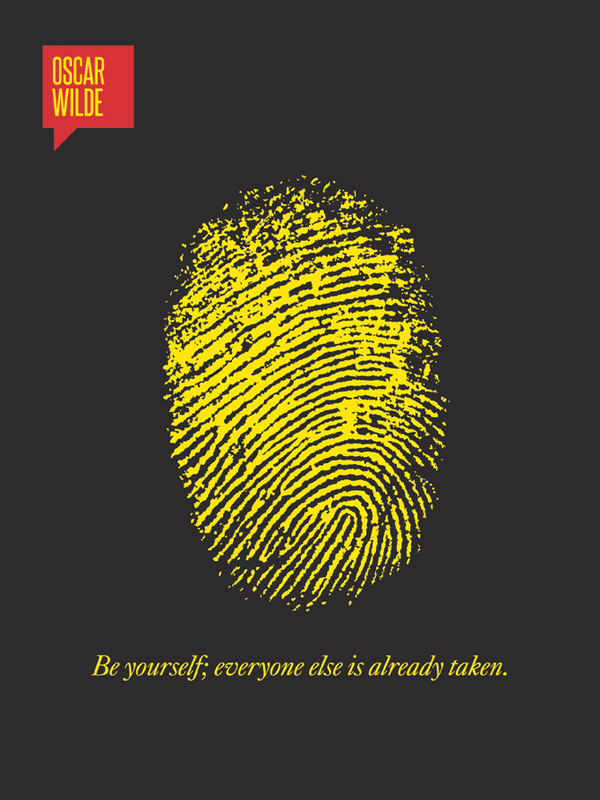 Out of all the quotes I think my favourite is Oscar Wilde's - "Be yourself; everyone else is already taken." It says a lot about people and what they might be going through. It resonates deeply with who we are and what we do with our lives. What's funny about quotes is that everyone reacts to them in a different way, they uproot emotion in all of us. Special Edition of the original Oscar Wilde design created for Oscar Wilde's 160th Birthday in 2014, by Ryan McArthur. Only for sale at La Crème de la Crème. Love what you're doing and hold on to it. You have to constantly explore new paths. Achieving my dreams, not giving up on them. What good thing can I do today? The art world takes itself too seriously. Our hard times define us, that's where the learning happens. Illustration seems to communicate more positivity.